Growers, packers, processors, and distributors of apples who wish to survive into the twenty-first century need to understand that they are now operating in an interconnected world market. The World Apple Market explains in lay terms the economics of the changes taking place in each phase of the apple business and assists firms in weighing decisions on organization, adoption of new technology, distribution systems and other crucial areas, allowing them to adjust operations and refocus their activities for the future. Readers will find the best available data on current industry operations and practices in this book, which is helpful to both established firms and new operators in reviewing their practices. 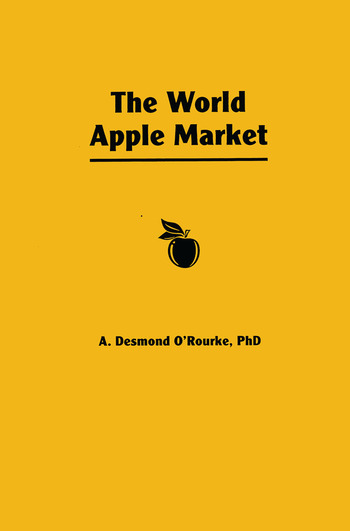 Author A. Desmond O?Rourke describes evolving world apple supply and demand, changing distribution systems, and governmental and other societal pressure to which the industry must respond. Throughout, the book focuses on the economic forces which affect firm and industry profitability and even more specifically, it focuses on how to maintain cost efficiency while maintaining the quality of a perishable product. The World Apple Market explains the economics of practical decisionmaking at every level of the apple industry. This is crucial information for managers of operations that grow, pack, process, and market apples. As changes in market demand, distribution systems, and government regulation continue to alter the environment for decisionmaking, this book assists all involved in the apple market from researchers and extension agents, to industry associations, suppliers, and apple promoters, to government planners, students planning to enter the apple industry, and investors weighing the feasibility of participating in the industry at any level.